This work ethic positively makes our hearts sing: Skylar Brandt and Gabe Stone Shayer literally busting their patooties in Russia under the relentless but lovingly critical eagle eyes of the Mariinsky's fabled Igor Petrov and Margarita Kulik in La Bayadere and Don Q. We certainly should be seeing their Don Q this year instead of Copeland's sham or two doses of Boylston's plodding Kitri. Meanwhile, the celebrina and her handlers are buying loads of "sponsored story" advertising in an effort to quell legitimate criticism of her sorry substandard dancing. She does like to talk about work ethic, it seems. She just doesn't walk the talk. And in the Philippines, Stella Abrera is polishing up her brand new Juliet along with a group that includes Gillian Murphy, Blaine Hoven and a half dozen others -- all working hard on improving their dancing. Work ethic in overdrive. And Sarah Lane is polishing up her Giselle in Texas at the Lake Cities Ballet where she danced the role for the first time nine years with Stephen Loch. Now a PNB soloist, Loch will be her Albrecht once again. Sarah has been lavishing thanks on Max Beloserkovsky and Irina Dvorovenko for all of their assistance in helping her to prepare Giselle, Kitri, and Nikiya. Work ethic in overdrive. 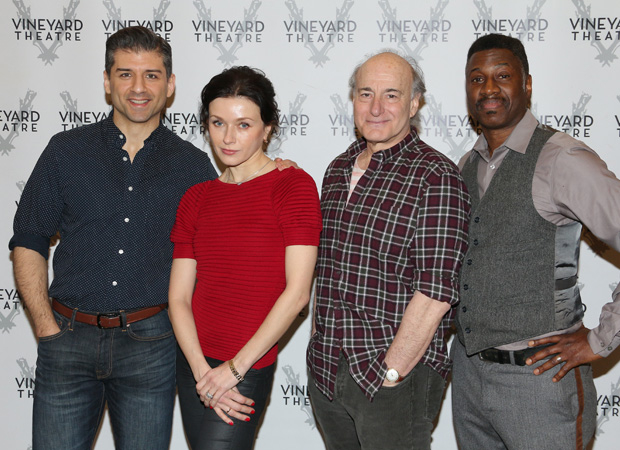 Speaking of Irina and work ethic in overdrive – here's a blurb about her new project at Vineyard Theatre with the sensational Tony Yazbeck. The Beast in the Jungle, based on the novella by Henry James, opens on May 4th and runs through June 10. John Kander, David Thompson, and Susan Stroman are putting this project of music, drama, and dance together. Readers may recall that Tony Yazbeck blew the socks off Haglund in the Prince of Broadway revue some months ago. Wonderful post, Haglund! Hope Skylar and the other dancers you mentioned will get their well-deserved roles soon. Loved watching the video of Skylar and Gabe! Skylar is such an elegant dancer. The way she moves reminds of the great Marrinsky ballerina Olesya Novikova. I am hoping she will be one of the Nikiyas in July when ABT brings La Bayadere to Los Angeles. The opening night will definitely go to Copeland. And Boylston never misses the opportunity to visit California. So the hope is rather slim. I wonder who coaches Copeland and whether she seeks outside coaching? In her interviews she mentioned taking classes at Steps on Boradway and studying acting but I never heard of her practicing with a ballet pedagogue. Dreamer, why do you think Copeland will dance Nikiya in LA? She's generally Gamzatti. I imagine that Makarova will be put to the test enough with trying to teach Boylston some classical refinement in Nikiya and probably won't have any patience left for Copeland. I suspect that you might see Skylar as Gamzatti in LA. That’s two great news—1) Skylar might be cast as Gamzatti and 2) Copeland doesn’t dance Nikiya. I was under the impression that Copeland’s dances all major roles—Kitri, Giselle, O/O, Juliet and Nikiya. I stopped paying attention to her repertoire because it was getting grotesque. It is good to know that Nikiya is actually not on this list. Not to pile on to the disapppointment that Boylston and Copeland getting undeserved opportunities at Don Q at the Met, but it looks like Stella and Joowon also did the Don Q wedding PdD in Manila. I’m curious to see how she did in the role. Good for her to making her own opportunities to dance roles ABT has kept away. I had the same reaction to seeing Brandt, Shayer and Lane's posts -- good for them for pursuing outside coaching so that they present their very best on the road and at the Met this spring. I've been heartened that the Misty video has generated some more balanced discussion on YouTube in recent days (after the initial wave of reactions from fans). It seems to have been an eye-opener for some fans who have bought the hype. I hope this brings increased scrutiny to her dancing at the Met, where, you know "everyone is a critic." That is interesting. I can’t imagine that the two couples wearing the Act III costumes would be dancing side by side. They must’ve split up the adagio, variations, and coda somehow? Great post, Haglund, thanks. I've never seen Skylar and she's wonderful! Does Makarova always coach for Bayadere? I'm assuming she doesn't have to approve casting, or we wouldn't be seeing some of those we're seeing ... right? Yes Haglund, our tickets are purchased for Beast in the Jungle - what a great opportunity to see Irina perform in a more personal setting, on a small off-Broadway stage. I can't speculate as to the quality of the show, but you know that Irina will be great! Marta, I'm pretty sure Makarova still has shock collars around the necks of everyone who dances in her La Bayadere. LLF, at least The Beast in the Jungle will be original from head to toe. I'm really looking forward to it. Did you see this Haglund from a few months ago? Thanks, Laurel. We really should be seeing this one as Kitri this year, not the Beginner I version from Copeland. Nor should we be subjected to two doses of the the plodding homely dancing of Boylston. Believe it, and believe that ABT casting is for sale to the highest bidder.